One of those things is the validated work units with 0 credits. Message 68274 - Posted: 20 Mar 2019, 6:59:29 UTC - in response to Message 68272. I am working on the zero credit issue now. I don't have an estimated time for when it will be fixed yet, but I will try my best. Sorry for the extended downtime yesterday, there were issues getting a firewall exception for the new server on the RPI network. Unfortunately, these issues were out of our control. As for the banner, I know on some screens it does not look ideal. This is a lower priority issue, but I will try to come up with something that looks better soon. Another low priority problem, but at least on my ipad the badges appear twice. Once at the user name and once after the rac. It looks like they do on desktop too. Not sure how I missed that. I think I found the issue with the credit assignment. 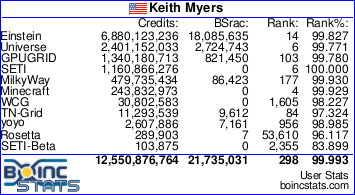 It seems that the newest BOINC server version no longer supports how we would set the credit per workunit. Should be a pretty easy fix, I am working on an implementation now. Do you guys think the banner looks better now? I tried making it a little smaller. Doubled up badges are fixed. Message 68293 - Posted: 20 Mar 2019, 18:03:14 UTC - in response to Message 68291. Message 68295 - Posted: 20 Mar 2019, 18:18:15 UTC - in response to Message 68294. I didn't receive any workunits. 20.03.2019 19:12:11 | | Internet access OK - project servers may be temporarily down. Message 68296 - Posted: 20 Mar 2019, 18:43:59 UTC - in response to Message 68294. That's strange, I don't see a similar issue on my machines. Can you give me a little more information about your issue? How long have you been unable to request work? What type of work do you want to request? How many times has your computer attempted to request work? Do they? Not sure who/what GauGAN is, sorry. Message 68301 - Posted: 20 Mar 2019, 21:35:03 UTC - in response to Message 68299. I was only joking. They demonstrated new AI software yesterday at GTC. Basically, if you can draw in MS Paint, you can draw a masterpiece landscape. An article about it is here. I, for one, welcome our new robot overlords. I'll leave it at that so this post doesn't go too off topic. Message 68302 - Posted: 20 Mar 2019, 21:55:59 UTC - in response to Message 68301. 20.03.2019 22:50:26 | | Internet access OK - project servers may be temporarily down. It has downloaded 40 WUs but not stating them as the exe is missing. Can you give me some more information? Has this happened multiple times? What version of the BOINC client are you running? Any other information you can give me to help me troubleshoot? I am not able to reproduce the issue on my end so I need more information from you. Message 68304 - Posted: 20 Mar 2019, 22:33:36 UTC - in response to Message 68303.
just opend Milkkyway after a long time again. now it was the first time I got WUs. as I said. it downloaded 40 WUs but only for the nvidia exe I get the error. does it come from another source than the data files?